Add extra accuracy to your espresso experience with the Brewista Smart Scale II. Designed to add consistency to every brew method, the Brewista Smart Scale II offers six dedicated scale and timer modes for pour over and espresso. 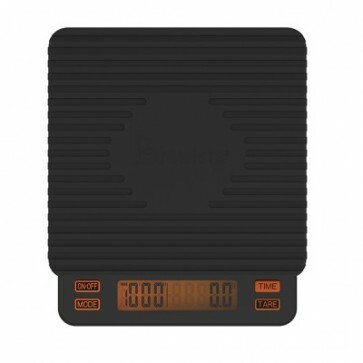 And user-friendly features like a backlit screen, water resistant build, and micro-USB port for quick recharges make the addition of a scale to your workflow an easy adjustment. 0.1-Gram Accuracy - The added accuracy helps dial in shots and perfect pour overs. 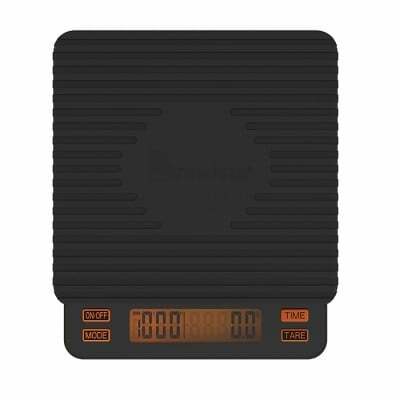 Water-resistant - rubber seals around the battery, USB plug and a water-resistant outer coating make the scale safe to use in your espresso machine's drip tray. An optional rubber baseplate adds extra protection from liquid. Scale Modes - Six user modes offer different sets of functionality for your brew technique. 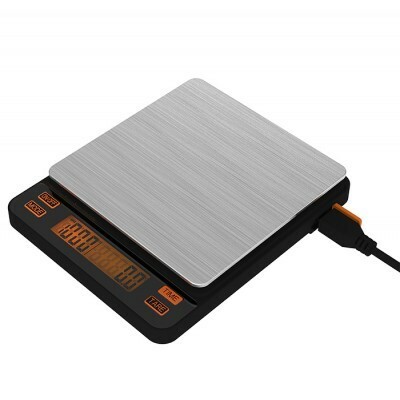 USB-rechargeable - Save on batteries with the micro-USB charghing port on the side of the scale. Programmable Auto-Off - Set the scale's auto-off for 30, 60, or 180 seconds, or turn off entirely. Affordable Alternative - There are very few compact scales for espresso on the market, and even less that support this featureset. Great for Espresso - The compact size of the Smart Scale is perfect for weighing your espresso shots, an often overlooked technique in home espresso brewing. USB-rechargeable - So. Convenient. Especially when paired with the scale's auto-off functionality to save battery life. Too Many Modes - For people who switch between espresso and pour over often, switching between all of the modes can get a little clunky. Orange Backlight - It's Brewista's color scheme, but we would have preferred a more neutral backlight color. A cheaper (if less attractive) alternative to the Acaia Lunar, especially if you don't need the app functionality. Mode 1 (manual) - tare and start timer manually. Mode 2 (espresso) - scale auto-tares and immediately starts timer. Mode 3 (espresso) - scale auto-tares; manual timer. Mode 4 (espresso) - scale auto-tares; no timer. Mode 5 (espresso) - scale auto-tares and starts timer when scale senses weight. Mode 6 (pour over) - manual tare and automatic timer. Make sure to unplug scale after charging. Wipe down scale with a damp cloth. Scale is water resistant, not waterproof. Do not soak scale underwater or rinse under faucet.